This article appeared on page 34 of the August/September 2016 Issue of Facilitator Magazine (the official magazine of the Restaurant Facility Management Association) - click here for the digital edition. Imagine it’s 3 a.m., and you’re at a restaurant location overseeing the final touches to a new store before the grand opening that morning. The crew is almost finished when you receive the call: A sewer backed up into a kitchen at another location across town. You quickly shift your attention, sending a plumber to deal with the flood and mess. But the usual tricks don’t unclog the drain. A camera sent down the pipe confirms the worst: A huge ball of grease is wedged in the wastewater pipes, and special equipment is needed to clear the clog. In the meantime, local health ordinances require the restaurant be shut down until the sewer backup is cleared. Your stomach sinks as you inform the restaurant’s general manager of what needs to be done. You know this incident will cost money to fix, inconvenience customers and employees, and ultimately result in lost revenue for the business. This situation is a facility manager’s worst nightmare, and it’s a result of restaurant employees improperly handling fats, oil and grease (FOG). A byproduct of all commercial kitchens, FOG is produced by meat and poultry scraps, butter, margarine, lard, cooking and fryer oil, and dairy products. Over time, traces of FOG coat floors and the wastewater pipes running from the restaurant’s location to the sewer system, and it can accumulate in the exhaust hoods and vent hoods in the kitchen. Some restaurant employees deal with FOG by pouring it down the drain. Others shuttle hot, used cooking oil in buckets to rendering bins outside, which can trigger accidents like burns, slips and falls. Cleaning up FOG can be messy, labor intensive and, in the case of fryer oil, dangerous. But proper disposal is not negotiable. The practice of pouring FOG into the sink might seem harmless; after all, it is still warm, is in liquid form, and slides easily down the drain and out of sight. However, as the liquid cools, the grease solidifies and accumulates inside the pipes. The cool internal surfaces of sewers provide the ideal environment for thin layers of FOG to build up. These layers thicken over time as other substances glom onto them, until they become a rock-hard substance that obstructs the flow of wastewater. Raw sewage and wastewater could back up into the business, when the flow can no longer get past the grease buildup. Plumber fees could be extensive, especially if the clog occurs after hours or over a weekend or holiday. Cleanup inside the restaurant is likely to be time-consuming and costly. Underground pipes could overflow into the street, possibly entering a storm drain and contaminating the local water supply. Raw sewage seeping into parks, yards and streets could lead to the spread of disease-causing organisms. Rancid odors typically result from raw sewage and wastewater backup. The local wastewater department could experience damage to their plumbing equipment from FOG, which could result in higher sanitation bills for customers. The city may issue fines and bills for repairing the damage. Clogged pipes due to FOG happen more often than you’d think. 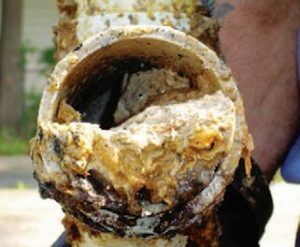 Pipe-cleaning companies report that 95 percent of the problems they fix are a result of grease, and 54 percent of sanitary sewer overflows in the United States and Canada are from grease blockages. In fact, FOG in sewer systems is a problem in almost all cities, likely due to an increase in the number of restaurants, an aging sewer infrastructure and improper disposal methods. While federal regulations are in place to prevent dumping petroleum oil or products with mineral oil down the drain, few regulations enforce oil and grease discharge from restaurants. Instead, it’s up to cities and municipalities to prevent this problem from occurring. The city of Seattle has taken action. It prohibits directly dumping grease down the drain and restricts how much grease can be in wastewater. As a facility manager, you need to be aware of the rules and regulations in your area and how to prevent this costly problem. Many local environmental agencies suggest installing grease traps or interceptors to eliminate FOG and related debris from entering municipal sewer systems in the first place. A grease trap can cost $3,000 to install, depending on the size of the establishment. This amount could be considered money well spent when compared to a clogged sewer that might cost the property owner more than $1,000 to fix, contingent on the extent of damage. Penalties are also steep. In New York City, establishments are fined up to $10,000 per violation for discharging grease into the sewer. Make sure the grease trap is designed to handle the amount of FOG that is expected from the establishment and that it is regularly maintained. Employees should be instructed to never pour grease down sink drains or into toilets. They should instead put liquids into covered containers to solidify and then dispose of them, or collect grease in a rendering bin for recycling. One proactive measure involves installing a closed-loop oil management system to automatically remove and dispose of the used cooking oil while adhering to sustainability initiatives. Allow grease to cool to a safe temperature after cooking and before disposing of it. Have dishwasher personnel use dry paper towels to wipe all pots, pans and plates prior to washing. Do not promote the use of cloth towels, which could accumulate oil that eventually ends up in drains when the towels are washed. Discontinue the use of garbage grinders/food disposals as food is scraped from dishes. Employees should use strainers in the sink drain to catch food scraps and other solids and then empty the strainer contents into the trash. Strainers decrease solids in the grease interceptor and leave less debris inside sewer pipes. Maintain a clean exhaust hood/vent, flue and fans. Keeping the hood and ductwork clear of grease buildup can significantly reduce the risk of a grease fire spreading. Consider an automatic system that uses a spray mixture of detergent and water to clean the hood, flue and fans daily. Create and use spill kits that include absorbent pads, paper towels or non-clumping kitty litter to remove grease from floors prior to mopping. Keep drains clean by pouring 0.5 cup of baking soda down the drain, followed by 0.5 cup of vinegar. Wait 10 to 15 minutes and then rinse with hot water. Ensure that new employees are trained on proper procedures. Do not use corrosive cleaning products on kitchen equipment. Such products may strip metal surfaces and build up metals in the grease trap or violate water pretreatment standards. The only thing that should be going down the drain is wastewater. Keep the pipes flowing and the business growing by properly eliminating FOG. Tina Swanson is Vice President of Customer Experience and Account Management at Restaurant Technologies. She has worked for nearly 20 years in human resources, sales, marketing and Six Sigma. Swanson spent many years at General Electric Co. and Ceridian Corp. prior to joining Restaurant Technologies in 2012.